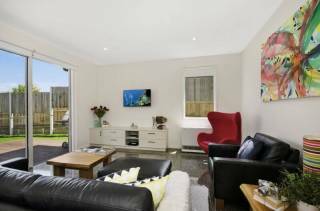 Getaway on Guthridge, wonderful new holiday house overlooking Ocean Grove Golf Club, and few steps from Barwon River boat launching ramp, The Groove Local Caf, and very pleasant River Walks. Check out the Pelicans, Black Swans, Plovers, Sea Gulls, Cormoron and fish from the jetty pier. A stunning family holiday destination. 10 -15 min walk to main street shops and Ocean Grove patrolled beach. 15-20 minute drive to Queenscliff, Pt. Lonsdale, Geelong, Torquay and Portarlington Olive Groves and Wineries. One hour drive to Lorne via the Great Ocean Road. Getaway on Guthridge has 4 bedrooms, main with queen bed, 2nd with queen bed, 3rd with two sets of bunks, and 4th with trio bunk (double on bottom, single on top) enough accommodation for 11 people. An ideal set up for extended family groups including parents children and grandparents enjoying a holiday together. The bedrooms are supported by 2 bathrooms, including two showers, bath, and 3 toilets. The living area includes tv, dvd central heating and split system to lounge dining areas, and ceiling fans in bedrooms. The kitchen is very well fitted out with microwave, dishwasher and ample crockery, cutlery and glasses, butlers pantry, island bench, to cater for holiday stays. Laundry includes washing machine and dryer. Outdoors there is outdoor furniture and bbq and fenced yard. The garage accommodates two cars. 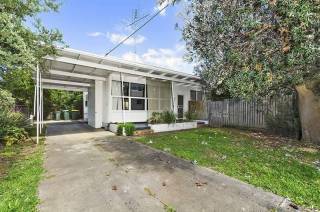 Getaway on Guthridge is very well furnished and fitted out for holiday accommodation. Park your car when you arrive and stroll everywhere. Getaway on Guthridge is set up with families in mind and accommodates all members of the family in comfort and style. You just won't want to leave, and return again and again. Full Rental is payable IN ADVANCE prior to collection of keys when checking in. This can be paid by cheque, cash, credit card or internet banking (call office for details). TWO TRANSACTIONS PER BOOKING ONLY (NO SPLIT THE BILL). Once final payment is DUE no refund is will be made unless the property is re-booked. ALL CANCELLATIONS AND BOOKING VARIATIONS, MUST BE MADE IN WRITING BY THE PERSON MAKING THE BOOKING. Occupancy times are from 12.00 Friday to 12.00 Sunday or Monday long week-ends and 3pm – 7pm and 10 - 11 am during weekly Dec/Jan bookings. Check your booking confirmation for details. Minimum 2 nights booking for all properties except one bedroom apartments. Whilst we will make every effort to provide you with the accommodation described in our booking confirmation, we must reserve the right to amend, vary or cancel any booking. Prices may be subject to change without notice - when advised in writing to you prices will not change for your accommodation. Standard check-in time is 3pm on the day of arrival and check-out time is 10am during December and January. 12 noon check-in and check-out on weekends from November to February. Any variation to ckeck-in and check-out times must be arranged with BGHR prior to commencing your stay. Late check-outs will incur a late check-out fee. December & January Summer bookings cancelled once final payment is due, the full amount will not be refunded unless the property is re-booked. BGHR is not responsible if the chosen accommodation does not "meet" the expected style of accommodation required. It is the guest's responsibility to read all terms and conditions of their booking. BGHR will not be held responsible for failure of utilities and essential services such as gas, electricity and water, nor appliances, should they cease to function. However, should it be made known to us, every attempt will be made by BGHR to contact the appropriate authorities to report such incidences and have supplies restored. Please report any failures damage, leaks, tree falls etc. to BGHR IMMEDIATELY as soon as these become evident and we will make every attempt to contact the relevant authorities and/or co-ordinate repairs. Immediate repair may be beyond our control. Power failures/stoppages are common in this area due to seaside corrosion. With multiple accommodation units/cottages at one property location- BGHR may choose which property is included in the booking. Noise at Properties: Only one warning will be issued for noise complaints. 2nd complaint will result in immediate departure from the property with no refund. BGHR will debit credit card or send an invoice for extra charges for cleaning, additional guests, extra bedrooms used, lost keys, call outs or damage to property. Your booking is made in GOOD FAITH by our office but may, under exceptional circumstances be subject to change as may be notified by the owner to us prior to the commencement of booking. We cannot accept responsibility for actions taken by the owner of the property if they cancel a booking. We cannot accept responsibility for actions taken by an owner of the premises outside our control, as in changes to a property, cancellation of a property, or sale of a property. Every reasonable endeavour will be made to offer alternative accommodation of the same standard in the same area, should this occur. BGHR reserves the right to cancel a booking at any stage due to unforeseen circumstances. Cancellations notified more than 30 days prior to arrival will incur an administration charge of 15% of total tariff. BGHR has the right to refuse a booking. Travel Insurance is strongly recommended in particular for both medical and cancellation coverage. 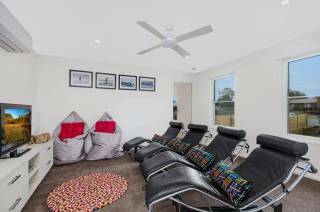 We at Barwon Grove Holiday Rentals want to make your stay with us as enjoyable as possible and we assure you that we will be working hard to do this. However, you will appreciate that to do this and to also maintain the standards of the properties for you and for future guests, we have to have some guidelines. These are based upon accepted industry practice and normal careful use of the property to avoid damage. All properties are different and some have special instructions to allow you to operate the utilities and services or for safety reasons. These are in the manual provided in the property, please make yourself aware of these instructions. Instruction books for appliances in the properties are located in the kitchen drawers in all properties. Check out time must be strictly adhered to and keys returned to key safe or our office by the due time, (please lock all windows and doors on your departure for week-end bookings). During weekly Dec/Jan bookings, please leave windows open to allow premises to air between bookings as cleaners will arrive shortly after your departure and are scheduled around these times. IT IS MOST IMPORTANT THAT THE NUMBER OF GUESTS STAYING IN THE PROPERTY IS AS PER YOUR BOOKING REQUEST. This is an occupational health and safety issue relating to fire safety, sanitation and hygiene issues and properties may be checked for compliance. If it is found that there are more people at the property, (parties) the tenancy will be terminated and any monies paid will not be refunded. At the time of booking guests are asked the number of persons requiring accommodation. If extra guests or bedrooms are used extra charges will be made. Please leave the Property as you found it, cleaners will attend when you leave to maintain a level of hygiene, disinfect showers and benches etc, but we expect the house to be left in a neat tidy clean condition, with bbq’s wiped over after usage, refrigerators cleared of your left over food, dishwasher stacked and left on when you leave and/or dishes washed and put away in cupboards, rubbish in rubbish and re-cycled bins. Extra cleaning charges will be made if these items are not attended to. Please leave used sheets & towels in laundry to allow beds to air between bookings and to let us identify what linen needs to go to the laundry. PLEASE DO NOT REMOVE OR MOVE FURNITURE AROUND THE HOUSE or from the house during tenancy. This can cause damage to floors, walls, furniture, and dislodge cables where the removal of TV/DVD/Videos is concerned. Do not bring appliances from home for use at the Holiday House as we cannot guarantee their safety. NO CARAVANS TO BE TAKEN TO PROPERTIES UNDER ANY CIRSUMSTANCES. RUBBISH – Please care for the environment and ensure all re-cyclables are placed in YELLOW topped bin. DO NOT MIX HOUSEHOLD RUBBISH WITH RE-CYCLE RUBBISH. The Garbo’s won’t take it!!! RED wheelie bin (household rubbish) is to be placed on the nature strip on Sunday night for collection early Monday Morning. YELLOW wheelie bin (recycling of bottles and newspapers) collected fortnightly, GREEN wheelie bin is for garden rubbish ONLY, collected fortnightly. Thank you for your assistance with placing these bins on the kerb if you are in occupancy during these times. Rubbish accumulates rapidly when you are on holidays! Breakages and any damage to accommodation and its contents must be reported to our office and paid for prior to departure. Tenants agree to allow our office or nominee to enter the rented premises to carry out any necessary repairs which may have arisen during tenancy. Items left behind at the house when you depart will be returned to the office and must be collected within 14 days, after this time they will be given to the local opportunity shop. Tenants and occupiers agree not to create any nuisance or excessive noise, causing annoyance to the owners or occupiers of any nearby premises. Remember, some of our neighbours are permanent residents and some holiday takers like yourselves. Only one warning will be issued. Should further complaint/s be received, this will result in immediate eviction from the premises and no refund. Your consideration is appreciated. No pets – animals and pets are not allowed inside any premises under any circumstances. We have several properties which are pet friendly (allowing pets OUTSIDE). If pets have been found to be inside, carpets need to be steam cleaned as per health regulations. This will be an extra cost charged to hirer. Guests staying at pet friendly accommodation are required to clean up gardens, lawns, paths etc after pet indiscretions. We cannot take responsibility for your personal property or if you damage your property while staying, please look after your belongings during your stay, locking the accommodation when you are not present etc. Property left at premises after you leave, must be collected within 14 days after which time it will be donated to the local opportunity shop. Your booking is made in GOOD FAITH by our office but may under exceptional circumstances be subject to change as may be notified by the owner to us prior to the commencement of booking. We cannot accept responsibility for actions taken by the owner of the property if they cancel a booking. We cannot accept responsibility for actions taken by an owner of the premises outside our control, as in changes to a property, cancellation of a property, or sale of a property. Every reasonable endeavour will be made to offer alternative accommodation of the same standard in the same area, should this occur. Where multiple accommodation properties exist on one property ie, units, apartments, flats, BGHR may choose which property is used for your booking. BGHR are not responsible for failure/s of utilities, essential services and appliances, please report failures to BGHR immediately and every attempt will be made to contact the appropriate people to organise repairs/connections. Immediate or same day repair may not be possible. POWER SURGES AND OUTAGES ARE COMMON IN ALL COASTAL AREAS DURING HOLIDAY PERIODS. Should appliances, ie, washing machine, refrigerator or small appliances break down, we will endeavour to organise repair of these or replacement of small appliances as soon as practicable. BGHR are not liable for loss of foodstuffs and or other items that may be damaged as a result of appliance, power or utilities failure. No refund or discounts will be made from tariffs for unusable appliances awaiting repair at the commencement of your stay. Extra charges that may apply: BGHR reserve the right to debit your credit card or send you an invoice for any amounts outstanding or any extra charge for cleaning including putting away of crockery, cutlery, pots, pans and glassware etc. extra charges for additional guests extra bedrooms used, lost keys, call outs, repairs or damage to property. Cleaning of BBQ if not left cleaned. Removal of animal waste at a “Pet Friendly Property”. Loss of keys and/or remote control. Breakages or damage. Missing linen, towels or items removed from property. Rejection of rubbish collection due to incorrect usage. Clients are welcome to come down and inspect properties before booking a property. We take great care to make sure the landlord has the property ready for incoming tenants, but will not be held responsible if the property does not meet with your expectations. 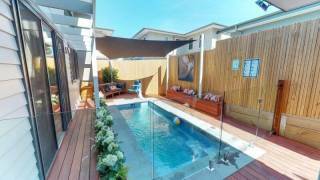 There are detailed photos of all properties on our website bgholidayrentals.com.au. Photos are taken by ourselves with our own digital camera, owners may also provide us with photos they have taken of the property. We have seen all properties on our website and believe photos provide a true and accurate record of the properties advertised. Once a property is booked, if cancelled more than 30 days prior to check in date, a 15% cancellation fee is payable, if cancelled less than 30 days prior to check in date, a 25% fee is payable. Once final payment is due no refunds will be given unless the property is re-booked for the same dates. Once Xmas booking payment is due and payable (by 1/12) no refund made if booking cancelled unless the property is re-booked for the same dates. Easter booking payments due 14 days prior to check in date. Whilst we take great care in representing properties registered with our service as accurately as possible, because of the variation in business arrangements with individual properties, we cannot accept liability for any act, neglect or fault on the part of the property owner or for loss, damage, expense, accident or inconvenience whether to property or person as a consequence of services provided by property owners or operators. Guests are reminded that they are responsible for the security of their belongings. Please ensure your accommodation premises is secure when not occupied. Guests will be held responsible for breakages, damages and losses incurred during their stay. For your own protection and safety when using wood fires, please exercise special care and ensure that they are left in a safe condition when unattended or when leaving premises. Upon vacating premises, please make sure all heating, electric blankets, appliances burners and lights are turned OFF and doors and windows secured. Most properties registered with our service are smoke and animal free, please see individual properties for details. 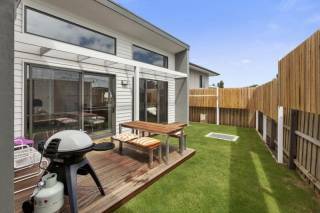 As a guest of the property booked, you indemnify Barwon Grove Holiday Rentals of any liability caused by you or your guests which may arise during the booking period. Barwon Grove Holiday rentals and the Owner of the property are not liable for any damages to the property, or injury to persons visiting the property during the occupancy period. It should be noted that these are the same guidelines we use for all bookings, with the exception of the bond requirement. Occupational Health and Safety issues will be covered at time of check in, these include use of gas and gas bottle bbq's, heating and cooling appliances, safety switches etc. Generally, most items you see in the images of our holiday properties are included for you to use during your stay. However, there are some exclusions such as certain rooms, cupboards, items or garages which may be reserved by the owners for their own use, eg. for storage. A garage or a room may appear in an image of the holiday home because it's not possible to take a picture without it appearing, it does not mean that the garage or room is necessarily available for your use. Do not assume it will be available. Always read the list of features and the written description of each holiday home. Our written descriptions of holiday homes try to be as accurate as possible but occasionally there are omissions of some details. If there is a specific facilitiy or items you require for a holiday house, please contact the office for details about its availability. Please note that very few of our properties have internet services or telephone services if you require these during your stay, prior arrangments must be made by you.